Former Minister Yoshinori Ohno (2nd from right) and MP Didier Quentin (3rd from left) were greeted at the Visitors Centre by Director-General Osamu Motojima, Deputy Director-General Carlos Alejaldre, and Jérôme Paméla, head of Agence Iter France. Members of Parliament all over the world have created "Friendship Groups" that play an important role in shaping bilateral relations between nations. The French National Assembly is home to 173 such groups. One of the most important, established in 1959, is the Groupe d'amitié France-Japon. The Group's 96 members develop actions that promote understanding and cooperation. 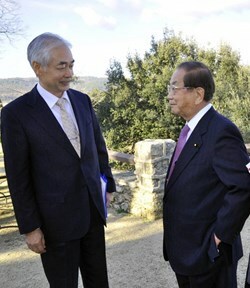 They are not diplomats, but politicians who have developed a special interest in Japan's politics, culture and economy. In parallel, there exists a "Friendship Group Japan-France" within the National Diet of Japan that is founded on the same principles and pursues similar objectives. Members of both groups led by their respective Heads—former Minister of State for Defense Yoshinori Ohno and MP Didier Quentin, Mayor of the Atlantic Coast city of Royan—were welcomed at ITER on Monday 17 January. 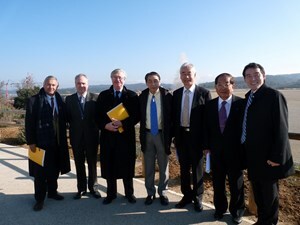 The delegation's five-day tour of France included only three stops: the delegation toured the cognac distilleries in Mr. Quentin's electoral constituency (Japan is the largest importer of French cognac); they paid a visit to the oyster parks on the Atlantic coast (French oysters descend from imported Japanese stock...); and they spent a half-day at ITER. The ITER Project is well-known to former minister Ohno who, as Senior Vice Minister of Science and Technology, was part of the international negotiations in the early 2000s. "I do hope people here are proud of working for ITER," Mr. Ohno confided after visiting the platform. "People should be aware that ITER is a unique project. This is the future of energy! ITER is of utmost importance, not only from a scientific point of view but also as a means of securing peace among nations. As a Japanese politician, I want to lend it my full support." Mr. Quentin, who had visited Rokkasho, home to the ITER Broader Approach activities, along with French Prime Minister Fillon in 2008, regretted that "... most people haven't yet taken the full measure of ITER's importance for the future. I will have many things to tell my MP colleagues when I'm back in Paris."